Affiliate Wiz is a great software package that gives users all the tools and features they need in order to manage and develop a successful affiliate marketing program. Although not the cheapest program we have come across, Affiliate Wiz does not (unlike other software packages we have reviewed in this category) charge a monthly subscription fee, so if you plan on keeping this package for a while, it could work out cheaper in the long run. 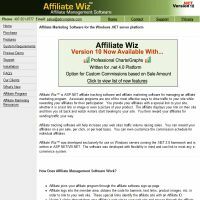 All in all, although not quite managing to make it into the upper reaches of our top ten in this category, we thought Affiliate Wiz had a number of features that our readers would find useful in building and managing a profitable affiliate marketing scheme. Affiliate Wiz was developed with flexibility in mind and can integrate quickly and easily with most e-commerce, shopping cart, merchant account and payment software. The software is built exclusively for use on windows servers running the .net2.0 framework, so this is definitely something to take into consideration if your existing system is non-standard or doesn’t fit this operational requirement. Whilst all the installation and support necessary to get your system up and running is provided, it is unclear whether this extends to users of this software who aren't running it on .net2.0 windows servers – so it’s worth checking before you purchase. One of the best elements of Affiliate Wiz is the amount of control an affiliate manager has over the structure of payments, commission and pricing within a particular program. Users can customize their reward structures (using PPC/PPL/PPS and other similar payment structures) and even customize the commission schedules for individual affiliates (helping to reward the success and hard work of the most successful affiliates). The programme also supports up to five tiers or levels of affiliate tracking, meaning affiliates are attracted to your program by the promise of the ‘filtering’ of referral monies through these tiers. Finally, there’s also support for multiple currencies and payment programs, meaning no matter where your affiliates are in the world, payments to them will be simple and smooth. Affiliate Wiz is relatively unique in this market in that it provides customers with a 100% web-based solution to affiliate marketing tracking and management. All features, including the service’s extensive marketing support service (offering banners, ads and other marketing material to Affiliate Wiz users) are hosted online, meaning there’s no additional storage or network costs for software users to incur. At between $699 and $1049, depending on whether you opt for an un-compiled version or not, this software isn’t cheap, but still represents good value in this market, especially if you intend to hold onto it for a while. If Affiliate Wiz sounds like it offers all the tools and features you need to improve traffic and boost sales at your website, hit the link below to check out the software merchant site to find out everything you need to know about this product.